April 1, 2014 is definitely going to be one of the best days of my life. I got an email from Microsoft congratulating me as one of the few people in the whole world who were awarded the prestigious Microsoft Most Valuable Professional Award this quarter. 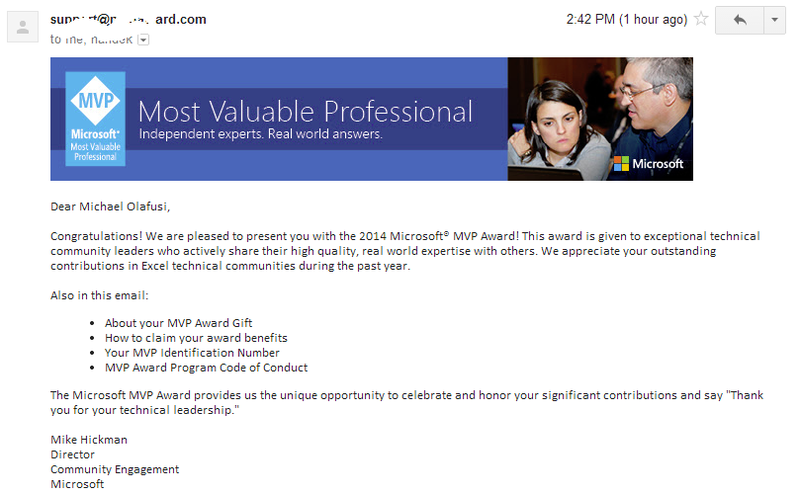 Today [April 1, 2014], 966 exemplary community leaders around the world were notified that they have received the MVP Award! These individuals were chosen because they have demonstrated their deep commitment to helping others make the most of their technology, voluntarily sharing their passion and real-world knowledge of Microsoft products with the community. Congratulations! We are pleased to present you with the 2014 Microsoft® MVP Award! This award is given to exceptional technical community leaders who actively share their high quality, real world expertise with others. We appreciate your outstanding contributions in Excel technical communities during the past year. This sure will boost hour profile in your new adventure. All the best. Also, do you have an idea of how many MVPs Nigeria has got? Yeah. Will come in very handy in my new career adventure. When I searched on Microsoft MVP site, I saw only myself. But it's possible there are other Nigerians who chose to make their records private. Hello Michael - welcome to the team! Wow! Thanks a lot, Bill! This is like a double award. The MVP and your welcome message!